Our village life would stagnate if it were not for the unexplored forests and meadows which surround it. We need the tonic of wildness, – to wade sometimes in marshes where the bittern and the meadow-hen lurk, and hear the booming of the snipe; to smell the whispering sedge where only some wilder and more solitary fowl builds her nest, and the mink crawls with its belly close to the ground. At the same time that we are earnest to explore and learn all things, we require that all things be mysterious and unexplorable, that land and sea be infinitely wild, unsurveyed and unfathomed by us because unfathomable. We can never have enough of Nature. We must be refreshed by the sight of inexhaustible vigor, vast and Titanic features, the sea-coast with its wrecks, the wilderness with its living and its decaying trees, the thunder cloud, and the rain which lasts three weeks and produces freshets. We need to witness our own limits transgressed, and some life pasturing freely where we never wander. We are cheered when we observe the vulture feeding on the carrion which disgusts and disheartens us deriving health and strength from the repast. There was a dead horse in the hallow by the path to my house, which compelled me sometimes to go out of my way, especially at night when the air was heavy, but the assurance it gave me of the strong appetite and inviolable health of Nature was my compensation for this. I love to see that Nature is so rife with life that myriads can be afforded to be sacrificed and suffered to prey on one another; that tender organisations can be so serenely squashed out of existence like pulp’ – tadpoles which herons gobble up, and tortoises and toads run over in the road; and that sometimes it has rained flesh and blood! – extract from Walden; or, Life in The Woods by Henry David Thoreau (1854). No tortoises or toads on the menu as of late; and yet, after not seeing any serviceable roadkill for months – since 25th Dec 08 to be precise, last week I broke my vegan wild food challenge – a month that became 40 days, in a veritable torrent and macabre freshet of roadside flesh and blood. 4 Comments on "A year eating 100% wild and foraged food: week 7"
there any way to follow your blog Fergus? I don’t see any “FOLLOW”! Hey Fergus, I came on one of your course a couple of years ago and you inspired me! 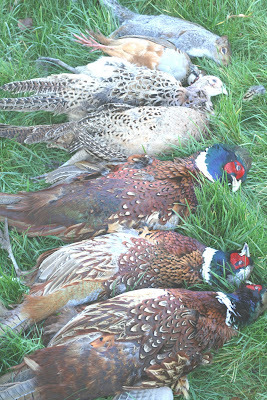 I’m off for a drive up the A39 in North Devon today looking for road kill pheasants. They are positively suicidal at this time of year but you’ve got to get there before the buzzards get them!